The new Ethernet-LCD (EL) controller is an inexpensive, well-rounded controller ready for a variety of embedded applications. It is intended for networking industrial process control, high-speed data acquisition, and especially ideal for OEM applications. It’s most unique feature is an integrated graphics LCD. It also features high-speed TCP/IP networking, 24-bit ADCs, DACs, high-voltage I/Os, relays? and in 100+ quantities, starts at only $99. The EL is a high performance, low cost, C/C++ programmable controller based on a 40/80MHz 16-bit CPU. It is intended for networking industrial process control, high-speed data acquisition, and especially ideal for OEM applications with basic user-interface requirements. Based on a 186-family embedded processors, it feaures standard embedded features like 2 RS232 ports (one RS485 port also possible), multiple external interrupts, TTL I/O lines, 3 internal counters, 256 KW FLASH and 256 KW SRAM, real-time clock. etc. 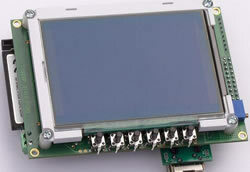 A low power graphic LCD with 192×128 pixels can be installed. The LCD has 71×54 mm viewing area with ultra bright white backlighting. Six mechanical push bottoms can be installed alone the side of the LCD. An integrated font library makes text display equally easy. Easy user interface software is available. The EL represents an ideal low cost , panel-mount user interface for many OEM applications. A unique hardware Fast Ethernet Module can be installed to provide high performance 100M Base-T network connectivity. This Ethernet module has a hardware LSI TCP/IP stack. It implements TCP/IP, UDP, ICMP and ARP in hardware, supporting internet protocol DLC and MAC. It has 16KB internal transmit and receiving buffer which is mapped into host processor direct memory. The host can access the buffer via high speed DMA transfers. The hardware Ethernet module releases internet connectivity and protocol processing from the host processor, which represents a huge improvement over software-based TCP/IP stacks. No processor cycles are used to track packet transmission/retransmission, timeouts, etc. The resulting system can easily handle transmissions in the 100KB/s+ range in real world applications. It supports 4 independent stack connections simultaneously at a 4Mbps protocol processing speed. An RJ45 8-pin connector is on-board for connecting to 10/100 Base-T Ethernet network. Software libraries and demo project are available for Ethernet connectivity. A sigma-delta 24-bit ADC(LTC2448) offers 8 ch. differential or 16 ch. single-ended input channels. A peak single-channel output rate of 5 KHz can be achieved. A 16-bit parallel ADC (AD7655, 0-5V) supports ultra high-speed (1 MHz conversion rate) analog signal acquisition. The AD7655 contains two low noise, high bandwidth track-and-hold amplifiers that allow simultaneous sampling on two channels. Each track-and hold amplifier has a multiplexer in front to provide a total of 4 channels analog inputs. Two channels of 12-bit DAC(DAC7612) can output 0-4.095V analog voltage. Seven high voltage sink drivers are installed, capable of sinking 350 mA at 50V per line, and they can directly drive solenoids, relays, or lights. A mechanical Reed relay provides reliable, fast switching contacts with a specification of 200 V, maximum 1 Amp carry current, 0.5 Amp switching, and 100 million times operation. An optional real time clock (DS1337, Dallas) is available. The EL supports up to 2 GB mass storage CompactFlash cards with Windows compatible FAT filesystem support, allowing user easily transfer large amounts of data to or from a PC. A multi-drop, long-distance RS485 serial port can replace one of the RS232 serial ports.